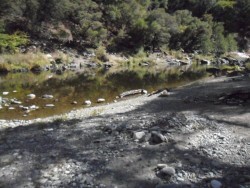 40 acre unpatented placer ming claim on the rich feather river. Claim includes a huge gravel bar on inside turn of river. Claim runs east to west approximately 1200 ft long. Plenty of water & level ground. Located 30 miles east of oroville, california, USA. Good maintained roads. Drive to top of claim. Feather river is fed from higher elevations near quincy & portola. Melones fault cuts across at higher elevation. Claim was hand worked back in 1850's and minimally since then. No signs of tailing piles or bank piles indicating that no dredging was ever done. Could be huge amount of gold in deeper layers & near bedrock. Claim can be worked presently with high banking or dry washing in summer. Can be worked year round as long as road to claim is open.